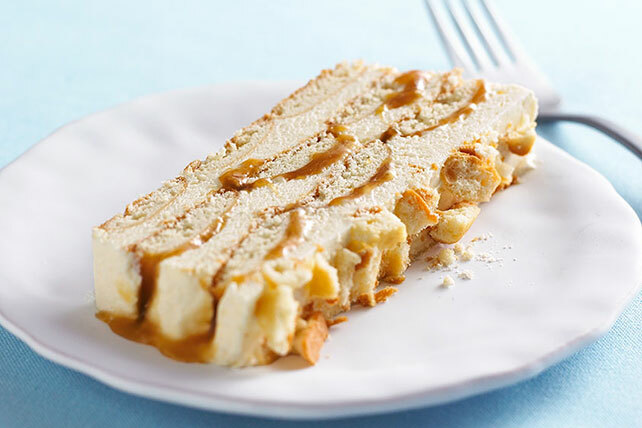 You don't have to be a dessert chef to make this dulce le leche dessert. Just top one luscious layer with more luscious layers, and freeze. Line 9x5-inch loaf pan with foil, with ends of foil extending over sides. Chop 4 wafers; set aside. Arrange 12 of the remaining wafers on bottom of prepared pan. Beat pudding mixes and milk in large bowl with whisk 2 min. (Pudding will be thick.) Stir in COOL WHIP. Spread 1/3 of the pudding mixture over wafers in pan; top with 12 of the remaining wafers and 2 Tbsp. caramel topping; repeat layers. Cover with remaining pudding mixture. Sprinkle with chopped wafers; press gently into pudding mixture. Freeze 4 hours or until firm. Use foil handles to lift dessert from pan; remove foil. Place dessert on plate. Let stand 15 min. to soften slightly before serving. Prepare using 2 pkg. (3.4 oz. each) JELL-O Vanilla Instant Pudding.